15 riders headed off at 9.30 from Canada Water with Philippa leading and David and Bruce assisting. Weather rather nice, with a continuation of the unseasonably warm temperatures of recent weeks. Aim was to follow a route basically along the Thames to Battersea Park. Negotiated More London (see photo), Borough Market and Westminster Bridge steps with care as already packed with visitors. At Westminster Bridge there were lots of people with banners and flags heading north towards the public sector pay demonstration. Crossed the Thames over Lambeth Bridge then a back street route mostly avoiding the embankment to Chelsea Bridge where we crossed back to the south side and entered Battersea Park. Our leader had found a great café by the lake that was almost empty. Several riders ordered a substantial brunch and there were also delicious Italian pastries on offer. Much discussion of how many calories expended compared with how many being consumed! Refreshed, we headed back along the south side of the river. Trying to get on to the Thames Path after Battersea Power station proved a challenge due to all the new building work. The first road signed to Thames Path along Cringle St reaches the river, but the path is now completely blocked. This still allows access to the houseboats. Reminded me to re-read Offshore, Penelope Fitzgerald's 1979 Booker Prize winning novel based in part on the time she spent living on a sinking houseboat at Battersea (see http://en.wikipedia.org/wiki/Offshore_%28novel%29). A second inviting access point at new “Riverlight” development also proved a dead end. So finally accessed the river via the longstanding red-brick paved piazza leading to the unimaginatively named Riverside Walk. This is now nicely landscaped past the round St George’s Wharf Tower and runs smoothly on under Vauxhall Bridge and to the Albert Embankment. At Lambeth Bridge we met seriously congested traffic that had been diverted due to the demo mentioned earlier. This proved a problem even when we went via The Cut and Long Lane. In the end we completed the ride along Grange Rd and through Southwark Park. 10 am and 14 riders in Peckham Square for the start on a very mild morning. Big range of ages and abilities, so 4 riders decided we were too slow and headed off on their own. Aim to do a figure of 8 route to Waterlink Way (Nat Route 21) and back. Reached the Waterlink Way at Catford around 11am, so needed to turn for a 2 hour ride. But everyone wanted to continue towards Lower Sydenham, so agreed a 12.30 finish time. Turned at Bell Green Sainsbury's after loo break. 5 riders wished to continue further, so headed on south down the Waterlink Way. Remaining 5 headed back via Blyth Hill. All were more healthy by the time they reached the summit, although it would take time for them to realise this. Route, with some suggestions for alternatives at tricky bits, at http://goo.gl/Xvg3gl. 12 riders for the "+" ride with a Burgess Park Cafe, 9.30, start. Leader Bruce had devised a "Parks and Sights" loop around west and south central London. First target Lambeth Bridge, then through to Horse Guards, up the Mall to Buckingham Palace and on up Constitution Hill to Hyde Park Corner. Along Rotten Row on the south side of Hyde Park and across Kensington Gardens to the Lady Diana Playground for a coffee stop at around 11am. Next back across Kensington Gdns and down Exhibition Rd to South Ken. Interesting to take a group down the re-modelled Exhibition Rd with no separation between pavements and carriageway. Seems to work. Leavng South Ken on to busy Pelham St needed care as lots of left turning traffic. Next down to Albert Bridge via St Lukes Gardens where we had to dog leg past a wedding group busy taking photos. Across the bridge and around Battersea Park. From Battersea Pk to south routes are very restricted due to the railway lines out of Waterloo having only limited crossing points. Went through to Queenstown Rd (LCN 5) and across Clapham Common. From the Common kept to LCN 25 through quiet roads to Brixton Windmill which was about to open for the Open House weekend. From Brixton Mill, steady downhill though back streets and Myatts Fields to Burgess Park. 18 miles, and only about 10 min late back! Thanks to Fiona for photos. 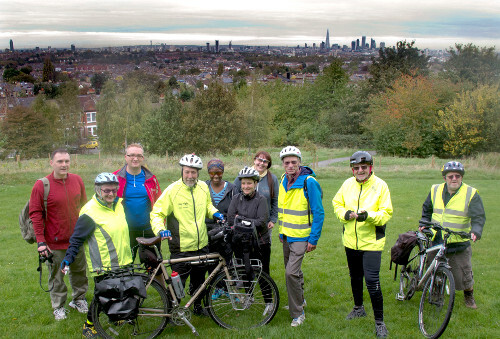 A group of 10 joined the ride from Canada Water to the London Eye via National Cycle Route 4. A pleasant cycling day although the sun only made brief appearances. Looped back through Waterloo Station to the Cut and Union Street then a loop around to Abbey Street across Jamaica Road and back via NR 4. Report from Philippa, who led the ride.